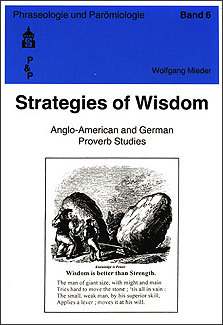 Anglo-American and German Proverb Studies. This volume includes ten essays on various aspects of Anglo-American and German proverbs and proverbial expressions. The first study presents a review of modern paremiography and paremiology and also points to desiderata for future research. Two chapters deal with the use of proverbs by Lord Chesterfield and Benjamin Franklin during the eighteenth century, and three additional studies investigate the function of proverbs in the works of Charles Dickens, Abraham Lincoln, and Frederick Douglass during the nineteenth century. There is also a detailed historical review of how the German proverb "The apple doesn't fall far from the tree" found its way to the United States. Turning to the twentieth century, yet another chapter discusses the proverbial dialectics in the works of Bertolt Brecht. Finally, there are two studies concerning the proverbial manipulations in Adolf Hitler's Mein Kampf and the proverbial rhetoric in Victor Klemperer's Diaries of the Nazi Years (1933-1945). A detailed bibliography and a key word index of the proverbs cited conclude the book.